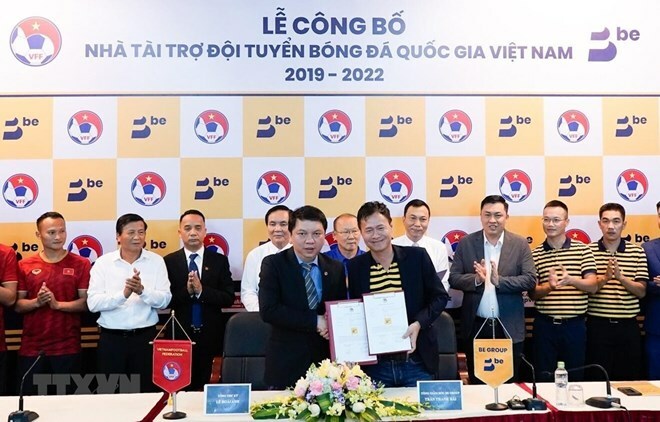 Hanoi (VNA) – Ride hailing service provider Be Group has signed up to be the main sponsor of the national men’s and women’s football teams; the U22 and U23 male teams; and the national Olympic team for three consecutive years from 2019 to 2022. The sponsorship was disclosed by the Vietnam Football Federation (VFF) at a ceremony in Hanoi on April 10. Accordingly, the company will aid the training and competing of these teams as they prepare to join a series of major events, such as the ASEAN Federation Football (AFF) Suzuki Cup, the SEA Games, the final round of the 2020 AFC U-23 Championship, and the 2022 FIFA World Cup qualification. Meanwhile, the road travel costs of team managers, trainers, and players will be fully sponsored. Be Group also commits to supporting the VFF in training young female players.